Being a mother to twins can be twice the work, but also twice the workout! You probably don’t have time to go to the gym, so how about working out with your babies? Put them in their stroller and get out there! Walking is one of the best exercises that anyone can do. It’s safe, it doesn’t take a lot of coordination and you can monitor your own intensity level. Combine your walk with body toning exercises and you will have a total body workout. Pushing a stroller incorrectly is a sure way to sabotage your posture and to wind up with an injury. Take an inventory of your body from head to toe. Everything should be in alignment. Your head should be balanced between your shoulders and sitting on top of your spine. Be careful not to let your head jut forward. Remember ladies, your shoulders are not earrings. Keep them low and pulled back (technically speaking…depressed and retracted). Scapular retractions (squeezing your shoulder blades back together) are a GREAT way to work on your posture. Your chest should be leading. Imagine that you had a string attached at your sternum (the bone between your breasts) and it was pulling you forward. Many new moms are shy about their new “full figure” and tend to pull their chest in as if they can hide it. This not only looks less than pretty but it can lead to muscular imbalances. Remember when you had abs? Ok, so maybe you never had a six pack, but your abdominal muscle is still there underneath that little bit of extra padding. Imagine your abdominal muscles as a corset. Pull that corset tight so all of the muscles are pulling in away from your pant’s waistline (without holding your breath). Keep a soft bend in your arms and keep wrists in neutral alignment. This can both prevent carpal tunnel syndrome and keep it from getting worse. Finally, let’s talk about your stride. Feet and knees should be facing forward. You can do long, powerful strides and/or short, quick strides. Work at an intensity where you are a little out of breath, but not so out of breath that you cannot talk during your workout. To complement the cardiovascular portion of the workout, add strength training stations throughout. There are lots of exercises that you can do with the stroller. In the following exercises, work up to 3 sets / 15 repetitions. The Lunge Walk – Stand behind your stroller with arms shoulder width apart on the handlebar. 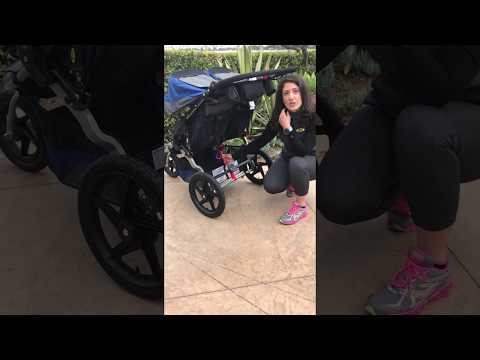 Lunge forward with one leg, pushing the stroller out in front of you. Your knee should be directly above your ankle and your thigh should be parallel to the ground. Alternate lunging legs. The Stroller Squat – Stand behind your stroller with your hands shoulder width apart on the handlebar. With your feet and knees forward, sit your bottom way back as if you were reaching to sit down. Weight is in your heals. Squeeze your bottom and come back to the starting position. Stroller Side Push – Stand sideways behind your stroller, with one arm holding the handlebar. Legs are hips width apart. Push that stroller away from you feeling a nice stretch in your side. Using your obliques (the muscles of your waistline) pull that stroller back in to the starting position. Your free arm should reach with out with you. Want further exercises for the rest of your body parts? We suggest using the outdoor environment as a gym. You can do push ups off a table or tricep dips off of a bench. Exercise tubing is a great way to work any body part and it takes up no room and no weight in the stroller (Go to www.spriproducts.com for information on exercise tubing). No matter what routine you create, start it slow and easy. You don’t expect your babies to run before they walk and neither should you! Working out with your babies is not only good for you but good for them. What a great role model you are to bring fitness into their early lives! For more information on FIT4MOM, go to www.FIT4MOM.com or call all 866-fit-4mom. TWINS note – If your babies are different weights, then make sure to regularly have them switch sides of the stroller. Pushing a stroller that is heavier on one side can cause muscular imbalances. * Get doctor’s permission before starting this or any exercise program.